You won’t have to pack nearly as many items, and careful packing – which includes wrapping and padding items and sealing and labeling boxes – can take a lot of time. You’ll be unpacking fewer items when you arrive, and there will be less to put away. You’ll use fewer packing supplies, including tape, bubble wrap, packing paper, and boxes, saving you money. The less you have to move, the smaller the truck you can rent. If you’re hiring a moving company, they will likely determine the fee by weight. Decluttering can seriously lighten your load without lightening your wallet. Selling items you no longer want or need enables you to raise money to cover part of the cost of your move. Now that you know why you should declutter, the question remains – how can you do it? While you may want to donate some of your items, you’ll probably want to make a little extra cash by selling others. MoneyPantry lists Carousell as its top choice in community marketplaces. With Carousell, you can snap a photo of the item you are selling with your phone, upload it instantly, and then add listing details. You don’t have to pay any listing fees or commissions. It’s completely free. You can chat directly with potential buyers. You can join special interest groups, such as school and neighborhood groups, and sell within them. You can also post listings to multiple groups at once. There are numerous categories for listing items for sale. You can instantly share your listing through Facebook, Twitter, or Instagram. The Carousell app is available for Android and the iPhone. Stacy Fisher of The Balance Everyday considers LetGo to be the most popular local selling ap. LetGo, according to The Droid Guy, has merged with Wallapop, which continues to maintain a separate app and website for local sales. One unique feature of the LetGo app is that it saves you time by titling and tagging your items using image recognition and artificial intelligence. You can list your sales items in multiple categories ranging from furniture and electronics to games and clothes. Numberous publications, including Wired, The New York Times, the Wall Street Journal, have featured LetGo, which means a lot of people are comfortable using it and you can reach a broad audience. The app is free and is available for both Androids and iPhones. OfferUp has apps for both the Android and iPhone that allow you to buy and sell locally. You can list items quickly in over two dozen categories, instantly message potential buyers, and check buyer profiles to see how reliable they are. The app is free for users but does offer paid premium features. For instance, you can pay extra to bump your listing to the top or feature it in special promotional spots. Many reviewers have suggested that the CPlus for Craigslist app is easier than using the website. Facebook has jumped on the garage sale bandwagon with its own local marketplace where you can buy and sell used items. The primary advantage of this marketplace is that the Facebook social network already has over 1.5 billion users, so that means a lot of people are on this platform. As a result, you could get a lot of visibility for your item. You enter your location when you list your sale items on Marketplaces, along with a price, photo, and description. Buyers can shop by zip code or general area. You can list your items on Facebook Marketplace using the Facebook app for Android or iPhone. Many people do not know this, but you can use eBay to sell items “for local pickup only.” When creating your listing, select “no shipping – local pickup only” from among the shipping choices. EBay offers several advantages, including its broad reach and well-known name, which gives you the ability to put your item before lots of people at once. You’ll also be able to take a credit card payment through PayPal before the buyer comes to pick up the item, which can save you some hassle. The main disadvantage of eBay is its hefty seller’s fees. The eBay app is available for both iPhone and Android, and the site can also be accessed online from a laptop, tablet, or desktop. VarageSale bills itself as “your online garage sale” and has a website as well as apps for both the Android and iPhone. It’s well-rated on iTunes, with 4.5 stars. VarageSale is unique in that it verifies users manually using real identity checks before they are allowed to sell or buy. This check adds an extra layer of security to your transactions and cuts down on scams. You can also view member ratings and average response times for buyers to help you decide to whom to sell an item if you have multiple interested parties. 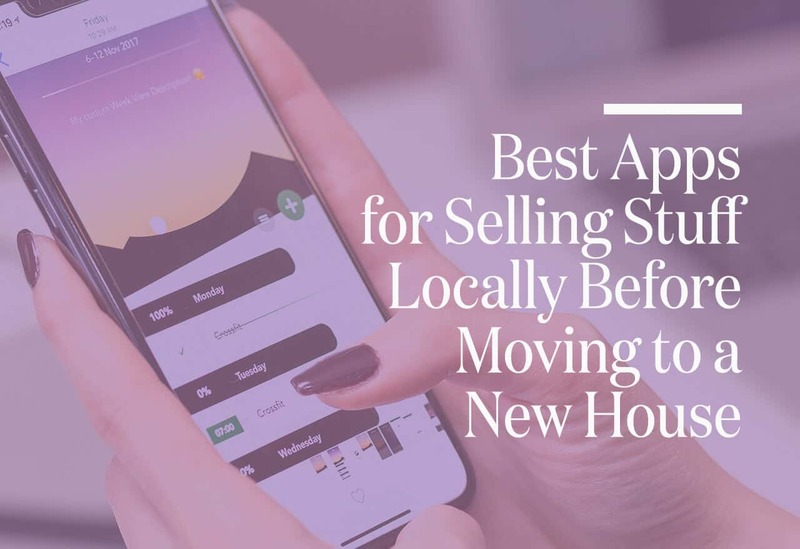 It’s free to sell on VarageSale, and even no-charge to bump your listing to the top – though it probably won’t stay there for long if everyone’s doing it. Because VarageSale has been featured in Huffington Post, Forbes, and Bloomberg, among other publications, it has a certain amount of name recognition, though nowhere near the scale of Facebook or Craigslist. Keep in mind, the things that you don’t sell, you can donate to charity or drop off at a local recycling center. Taking the time to get rid of stuff before your move, will make your moving services affordable, whether you’re renting a truck or hiring a mover.